Fall is my favorite time of year. The leaves and colors and pumpkin everything and hoodies and cool weather makes it magical. When you’re having a Fall or early Winter baby, incorporating the seasons theme into your baby shower is a must-do. If you’re not throwing your own shower, suggest this post to your friends or family for some amazing ideas. Here’s the top 11 Fall Themed Baby Shower Invitations we found (and love) on Etsy. Here comes the little pumpkin. This super cute invitation is sure to be a winner. Grab this gem on Etsy here. A little pumpkin is on the way! This DIY printable invitation is perfect for the leaf and fall themed shower you have planned. Grab it here. This next shower invitation is an unusual yet lovely mix of colors. This is also a DIY print, meaning you buy it, download it and print it yourself. This makes it great if you’re in a time crunch. Grab this one here. I am kind of loving the unique color choices in some of these invites. This invitation allows you to bring in SO many unusual and unique fall colors. Grab it here. Can you imagine a shower theme around this? I kind of love this simple rustic card idea. It leaves room for a creative and unique baby shower. Grab it on Etsy here. So seriously, what’s not to love about a card that REALLY says “HEY, we’re having a FALL BABY! !” This super adorbs card is perfect for just about any shower for any lady having either gender of baby. Grab it here. Who doesn’t love Chevron? This super sweet pumpkin invite feels like lattes and pumpkin spice. Water color is all the rage right now, so how about a watercolor pumpkin invite. Super sweet and not over the top busy, this invite is perfect for the simple sweet baby shower. Grab it here. The use of color here, again, is unique and interesting. Of course, my fall wedding used colors very similar, so I kind of love it. Check out this design on the Its4Keeps shop on Etsy. A unique twist to plain flat invites. This diaper with a little pumpkin clip is to cute to ignore. You need to grab this one on Etsy here. 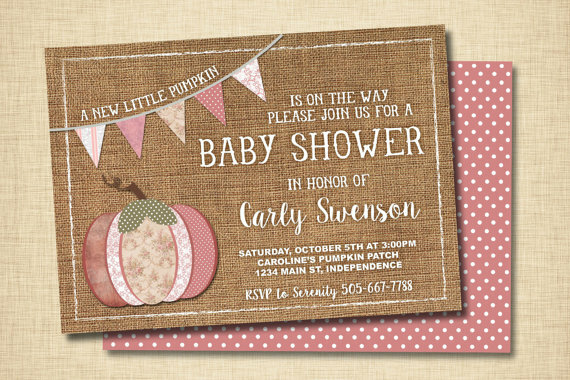 Last but not least, this baby shower invite is perfect for a rustic or outdoor themed shower. This digital file also includes the back design. Grab it here.